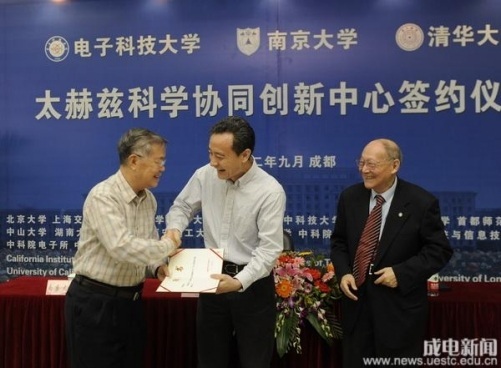 Academician Zhou Binkun, one of the Center's leading scientists, congratulated the establishment of the Center. He said, “This Center is a natural collaborative organization thanks to the earlier long-time cooperation among all the units. THz research has a bright future and it is a virgin land for us to explore. 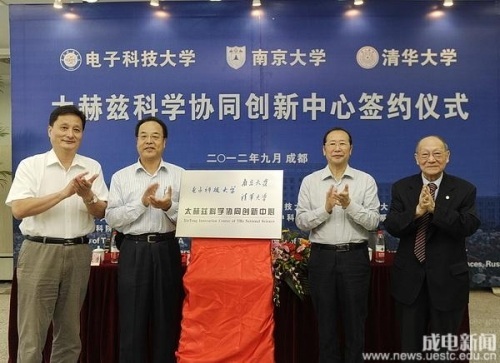 The founding of this Center will surely play an important role in helping China take a place in the research of THz S&T all over the world.” Other speakers included Vice president Kang Kejun of TU and President Assistant Li Cheng, etc. They all expressed their whole-hearted congratulations and support to the establishment and development of the Center. With three researching directions, the Center consists of a Council, an Academic Committee, and a Management and Consultation Committee. 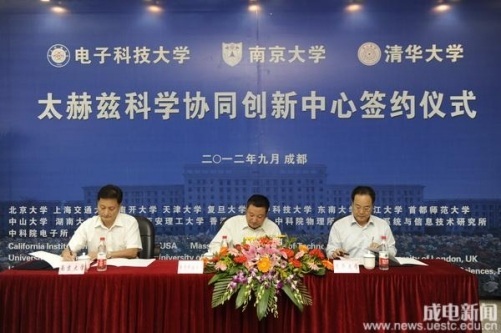 The Board Chairperson is Prof. Wang Jinsong and the Vice Chairpersons are Prof. Yang Xiaobo and other professors from other two universities. Meanwhile the letters of appointment were also issued to the professors and scientists related. Many other units also did great contribution to the founding of the Center. They are Peking University, Nankai University, Tianjin University, Fudan University, Shanghai Jiaotong University, Capital Normal University, Southeast University, Zhejiang University, Sun Yat-Sen University, Hunan University, Sichuan University, Huazhong University of Science and Technology, Xian University of Technology, City University of HongKong Institute of Physics CAS, Shanghai Institute of Microsystem and Information Technology CAS, Institute of Electronics CAS, and Institute of Semiconductor CAS in China. The foreign units include Massachusetts Institute of Technology, California Institute of Technology, University of California Davis, Queen’s University, University of Essex, Humboldt-universitat zu Berlin, PTR, IAP, Lebedev Institute, Osaka University, etc. There are a dozen of international prominent invited guest professors such as Chair of K. J. Button Prize Committee of Royal Society, and K. J. Button winner, T. J. Parker, etc.